Providing for nature enriches us all ! Pole Squirrel Baffles that block squirrels from bird feeders make them squirrel proof. 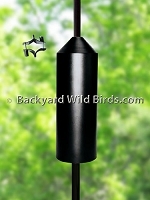 These Bird feeder Pole Squirrel baffles block squirrel attacks from below. That is they stop squirrels from climbing up the pole. Cone Squirrel Baffles are wrap around baffles and nice to use on shepherd staff poles or 1" diameter bird feeder poles to squirrel proof the poles. The wrap around style can also be useful because the pole does not have to be disassembled to mount. The cylinder style baffles are used on 1" diameter poles or 4x4 posts. They need to be able to slip down over the pole for mounting. These baffles are very effective and do a good job. The height can be set for either style with their mounting hardware to be the most effective, usually about 4 to 4.5 feet off of the ground. 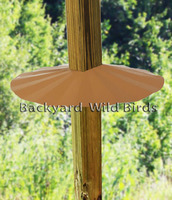 Wrap around 17 inch cone Squirrel Baffle for shepherd staff poles and bird feeder poles. Get some squirrel proofing today! Cone Pole Squirrel baffle is an 18 inch diameter wrap around cone squirrel baffle that squirrel proofs shepherd staff and 1" bird feeder poles! Mount squirrel baffle by simple wrap around! 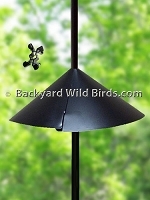 Large wrap around cone squirrel baffle has 18.5 inch diameter for use on bird feeder poles and shepherd staff poles. Squirrel baffle has decorative scallop edge. 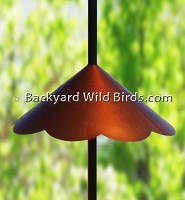 Copper tint wrap around cone squirrel baffle (18.5" ) diameter for bird feeder poles and shepherd staff poles. Large 28 inch long by 6.25 inch diameter Raccoon Baffle, for 1 inch diameter bird feeder poles. Superb way to Raccoon and squirrel proofs poles by protecting bird feeders from below. 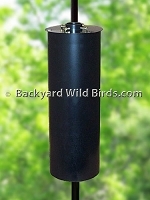 Cylinder Squirrel Baffle is a very effective Squirrel Baffle for 1 inch diameter bird feeder poles. 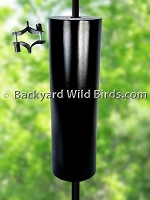 Torpedo squirrels efforts to climb up bird feeders poles from below with this 16" long capable squirrel baffle. Squirrel Baffle For Poles is for 1 inch diameter bird feeder poles, squirrel proofs by protecting bird feeders from below. 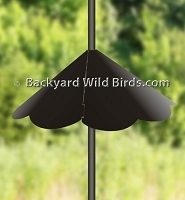 Effectively block squirrels on Bird feeder poles with this unobtrusive 16 in. clear plastic pole Squirrel Baffle. Works on 1 inch diamter bird poles. Post Squirrel Cone baffle is a tan wrap around squirrel and small raccoon baffle used on standard 4x4 posts to protect Bird feeders and bird houses. Can wrap around without post disassemble. The raccoon baffle for poles is a large baffle with its 24 inch long and 8 inch diameter. Great way to Raccoon and squirrel proof bird feeders and bird houses. The raccoon baffle for poles is one of the largest with its 28 inch long and 8 inch diameter. It is a heavy duty flat top cylinder Raccoon Baffle and great way to Raccoon proof bird feeders and bird houses. Squirrel Baffle Wrap Around is a large 22 inch Metal baffle for 1 inch bird poles and is a good way to squirrel proof bird feeder poles without disassembling the pole to put on. 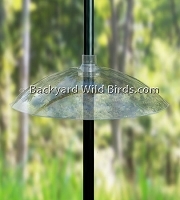 Squirrel Stopper Jr Pole Baffle features an all metal design. Uses spring technology, so the baffle moves up and down and side to side when squirrels or raccoons try to climb it. Absolutely will stop ground attacks from squirrels and bring a smile to your face when they fail. Copyright Backyard Wild Birds. All Rights Reserved.